There's a lot to love about USB. The plugs are small and convenient. The cable can carry both power and data. Plus, USB is, well, universal. This is why USB is considered by some to be the future of electricity. Smart grids, more convenient storage, solar power—according to a new Economist report it's all easier with USB. Weirdly, USB's potential is driven, in part, by a system of transmitting and distributing electricity that's been out of fashion since the late 19th century. I'm talking, of course, about direct current (DC), the standard championed by Thomas Edison that eventually lost out to Nikola Tesla's alternating current (AC) as the global standard for electricity. While AC won out for its ability to switch between different voltage, low-voltage DC is cheap, efficient and doesn't require an adaptor. For a few different reasons, USB happens to be an ideal vehicle for DC power. The latest issue The Economist takes a close look at the future of USB and suggests that the little plug you now use to charge your phone or plug in your keyboard could replace conventional power outlets altogether. We're already seeing a whole host of smaller USB-powered devices—from heaters to blenders—but USB will be able to power much bigger devices starting next year when a new standard is introduced. Imagine the convenience of a USB-powered TV that uses the same plug for power as it does for data. A low-voltage DC network works well with solar panels. These produce DC power at variable times and in variable amounts. They are increasingly cheap, and can fit in windows or on roofs. Though solar power is tricky to feed into the AC mains grid, it is ideally suited to a low-voltage local DC network. It works even better if the network has a biggish central battery hooked up to the mains grid, which can charge itself up at night when power is cheap. But the real prize comes when several buildings combine such DC networks. Pooling supply, demand and storage gives you the makings of a “smart grid”—an electricity supply system which is more resilient and thrifty than the existing set-up. The next big step for the USB standard is the introduction of USB Power Delivery or USB PD systems. While USB PD devices will start to hit the market next year, it'll hit primetime in 2015, and the specs speak for themselves. 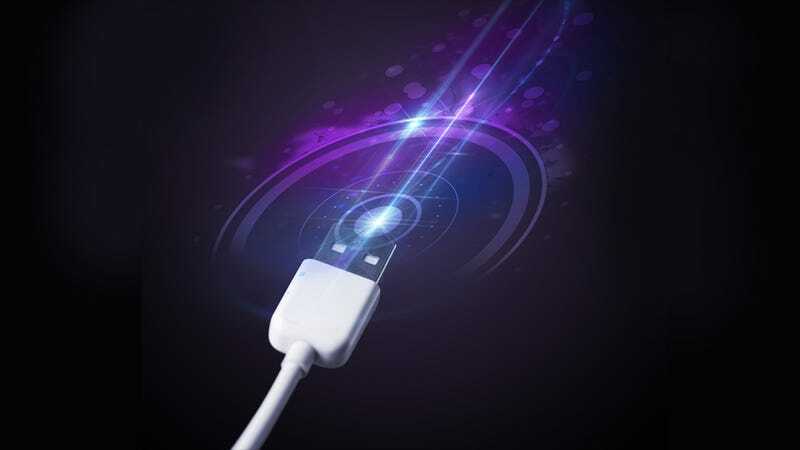 USB PD increases power the standard's power level to 100-watts and enables electricity to flow in both directions. It's also tailored to optimizing power usage, giving each device exactly the amount of electricity it needs.